After all of these months of not writing , something unexpected has inspired me. Not the wild, vastness of a sweeping Rhossili Bay on a stormy day , nor the majesty of towering cliffs of Pembrokeshire. Nah, it was some daft meme on facebook. 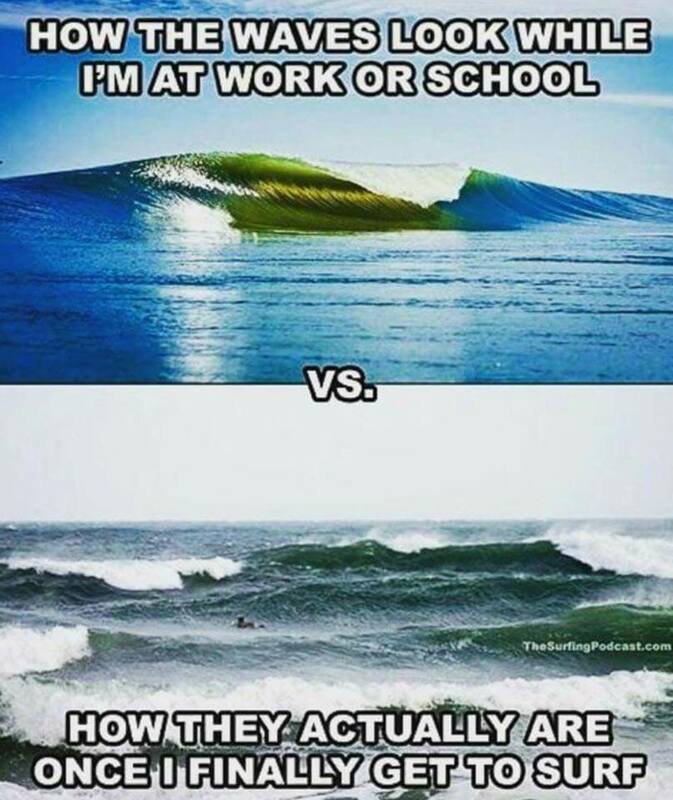 This my dears, is the reality that faces the average British surfer who has a job and sometimes has to use precious potential surf time to do other things. This is not what I anticipated when relocating to the coast to surf. With winter reducing potential time in the water even further, this meme is my life! 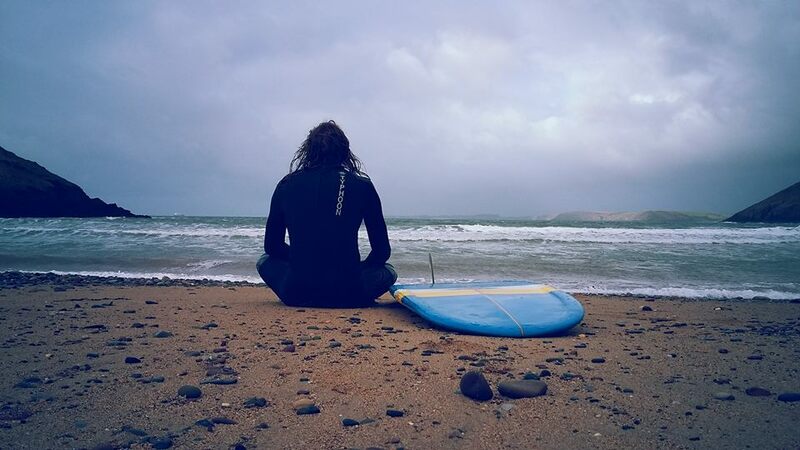 To all of the landlocked surfers, please stop torturing yourselves thinking you are missing out and that the whole UK surfing population are always surfing while you slowly suffocate in inland cities, they are not I promise you. Please stop torturing yourselves imagining all the waves you will never surf that you believe others are. Those waves were last week while we we working, maybe in a few days time if the wind swings around, maybe next week if magic seaweed is wrong or maybe in summer if the cow jumps over the moon . In reality we have lives and jobs and especially in winter the opportunity for surf often comes down to just 2 days reducing the probability of catching it on a decent day. Ahh a decent day, now there’s another thing. Last spring, just after Easter we had a 5 week flat spell . This Autumn and winter we have had storm after storm after storm and while some spots might light up in certain stormy conditions, the ones that do are for the kamikaze, crazy good, surfers not for your average joe like me . The wind and tides are often right but, only in the evenings after dark. On weekday mornings the webcam often reveals a glassy 3 footer shimmering in the sun as I sit here trapped at work having my soul sucked out of me. I’ve often had 4 weekends of no waves or terrible conditions and on the 5th I go away for a weekend in an attempt to have a life other than sitting around waiting for waves and the conditions clean up and the wind goes offshore just as I’m driving across the border into England. The truth is living by the coast is not the guarantee of regular, decent surf that as a frustrated Landlocked surfer I had imagined it would be. Don’t get me wrong, being here is fabulous especially on those magical days when it all comes together, being in the right location then really comes in to it’s own. But, now that I know the reality, looking back to when I was Landlocked, it was never as bad as I made it out to be and perhaps I sulked a bit too much back then over what I imagined I was missing out on. Landlocked, weekend warrior, living by the coast, beginner, world champion, summer only surfers or the twice a year surf tripper. We are all the same. We are all missing out on waves, the waves that live in our imaginations . That’s what the lure of surfing is, it underpins our addiction and fuels our desire to get to the coast . The unwavering belief that the best wave of your life is still out there and it is, it really is.